Power Indicator Light. 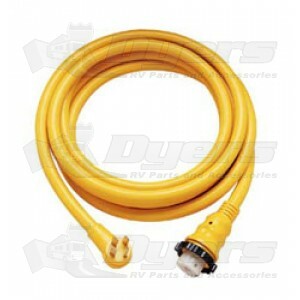 Coach side connector features a molded-in LED light: When it glows red, you know you have power to the RV. Comfort Grip: Connector end is molded to fit the contour of your hand. Thumbprint Locator: When the thumbprint is in the 12 o’clock position the blades line up for easy connection. A cordset with all the features you need! When the LED power indicator light glows red, you know you have power! Contour grip ends are molded to fit the contour of your hand. Thumbprint locator identifies ground blade location for easy connection. Features super flexible 6/4 cable and easy lock system. High quality marine grade construction and watertight molded plug and connector ends. Includes threaded ring and Easy Lock™ ring. 125/250V.